What's The Basic Differences Between Google and Bing? It’s very likely that you could count the number of people who’ve never heard of Google on one hand. It was the second “search engine” to be introduced to the Internet in 1998, after Yahoo was developed in 1994. Yahoo began as more of a database of websites organized through hierarchy instead of a searchable index of pages, while Google focused on providing a service for people to search pages on the Internet. Over the past 20+ years Google has evolved to include social media sites, phones, Wi-Fi devices, email services, news aggregators, calendars and more. Google seemed to have cornered the market and has since continued to evolve to match the changing technological times. Bing was introduced in 2009 through the merging of Windows Live Search and MSN Search. When it was released, it was announced that the search engine Bing would also move on to take over Yahoo. Since 2009, Bing has expanded, updated and evolved into what it is today. It has become a service that mirrors Google’s advancements and will continue to have an impact in the world of search engines. So what does that mean for Internet users and business owners? Well, if you’re like most people, you probably have a preferred search engine and are an avid enthusiast for it. Once chosen, people don’t often make the switch to another search engine, but at the end of the day, is there really a difference? That’s what we’re here to find out. If you’re a business owner, small or large, read on. Why? While there are tons of SEO similarities between the two search engines, there are also lots of differences, which are crucial to your success. Even the basic differences between Google and Bing could lead to your website ranking on the first page of Google, but on the tenth page of Bing and that has a major impact on your business’ reach. In this article, we’re going to delve into the functions that are unique to Google and Bing as well as mention some similarities between the two so you can improve your SEO efforts across both. Here are a few of the things that help you rank well in Google’s algorithm. It comes as no surprise to note that Google understands Internet trends. As more and more people have turned towards making Internet searches on their mobile devices, Google has begun to prioritize mobile optimization. In fact, they are moving toward ranking first on the quality of your mobile content followed by desktop content, a.k.a., using a mobile-first index. In order to stay relevant, take the time to make sure that each page of your website is optimized for all mobile devices. If you need to hire a professional to help make the changes, it will be worth the investment. The world changes each and every day and because of that, Google likes to see updated content. When you regularly post new and engaging content, Google rewards you and your rankings grow. This isn’t how it works on Bing. Bing prefers old content that has proven to be reputable through the ages and has generated a lot of traffic throughout the years. One of the greatest things about Google is the fact that it uses it’s advanced technology to delve into each and every website that is being ranked. Using this technology, Google has the ability to interpret the context of a page through its heading, subheadings, titles and content rather than solely based on the use and frequency of keywords (which is what Bing does). Don’t be mistaken, keywords are still important, but Google will also reward you for strong, relevant content throughout each page. Regardless of where your page is on your website, you’ll have an equal chance to rank on Google. Google encourages landing pages and internal pages to have relevant, engaging content that will answer questions for those searching and reward those that do. As long as your internal pages are following best SEO practices and are high quality in terms of content and copywriting, they will be ranked well. Google uses backlinks as a huge indicator of whether or not your company is worth ranking. On Google, the more you have, the higher you’ll rank in SERPs. Seriously, this can’t be stressed enough, Google loves backlinks. While they will still help you rank in Bing, it’s not nearly as important. For both search engines, when you use backlinks, make sure that they are high quality. The more trusted the site is that backlinks your page, the more your credibility will raise. If you get low quality backlinks, both Google and Bing will take notice and your rankings can drop. Here are a few of the things that will help you rank better in Bing’s algorithm. The developers at Bing decided that a company’s homepage is far more important than the internal pages, especially when it comes to ranking. Bing displays results on SERPs based more on homepages than they do on internal site pages and landing pages because they adhere to the more traditional assumptions of site structure. This is opposite of Google, who ranks each and every page individually based on the SEO tactics that are implemented. In order to excel in Bing’s SERPs, make sure you have a strong, SEO optimized homepage. Rather than the interpretive manner that fuels Google, Bing will need you to spell it out exactly. In fact, Bing relies on exact keywords in order to interpret the context of a page. The key word here is exact. Be very direct and intentional with your keywords when trying to increase your ranking on Bing. Social media is important in today’s business world, regardless of the SEO benefits that it brings. On Bing, social media has a huge impact on your rankings and should not be ignored. The technology that Bing uses on their SERPs allow you to see if your friends on social media have rated or recommended a company/product you’re searching for, which is something that Google has yet to successfully implement. Luckily, focusing on social media for Bing’s SEO efforts is a win-win for your company. The more likes and shares you have, the higher you’ll rank. Meta descriptions, the short summary that appears under your link on a SERP, are important on Bing. Make sure you use exact keywords and write a strong meta description in order to rise in rankings on Bing. While this is also a factor on Google, it’s not worth nearly as much weight as it is on Bing. Be direct when writing this for Bing and clearly state the name and purpose of your company along with the relevancy of your site. While this isn’t necessarily a difference per se since both Bing and Google offer multimedia searches, Bing has definitely dominated the market in terms of effectiveness. Bing has an “entity understanding,” which means that high quality pictures, videos and audio clips will all improve your ranking in Bing’s SERPs. Since Google mainly uses HTML, it still primarily relies on text and their multimedia searches aren’t nearly as strong or effective as Bing’s are. In terms of other multimedia searches, Bing has also dominated the market for voice searches. In order to optimize your page for voice search, use lengthier longtail keywords that would occur in natural language across your target audience. In addition to the aspects that are unique to both Google and Bing, there are a few striking similarities that should not be ignored. 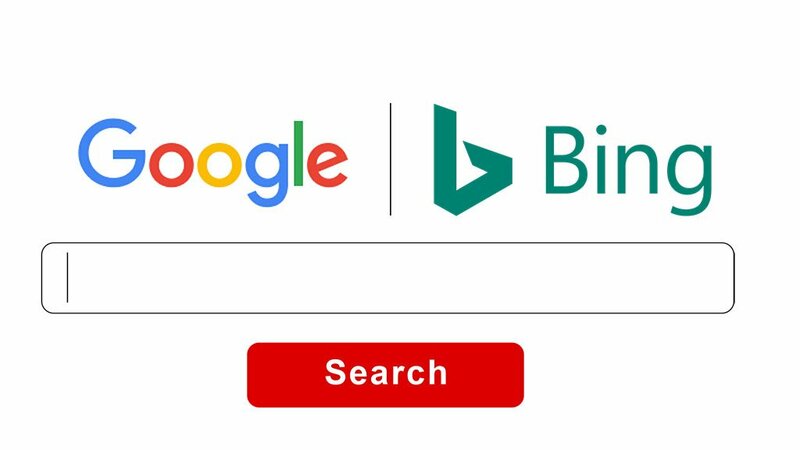 These similarities are a great way to combat the basic differences between Google and Bing and can help boost your SEO for both search engines. Regardless of the search engine you use, the bigger your brand is the higher you’ll rank. This is an automatic function of both search engines; so if you’re competing against the big boys, consider choosing your keywords strategically to boost your rankings. As you grow in company size and influence, so will your rankings. Both Google and Bing are strongly geared towards local searches, since a huge percentage of people searching are trying to find things near them. Make sure you implement strong local SEO strategies and you’ll be in good standings. While there are tons of external SEO tools that you can implement in order to track and access information, both search engines have their own internally. Bing uses Webmaster Tools and Google uses Google Search Console. At the end of the day, the basic differences between Google and Bing revolve around the fact that they have different algorithms used to rank their SERPs. This poses an interesting challenge to anyone strategically working in SEO. If you optimize your site for one search engine, there’s a chance it might not even show up on page 1 in another. The best option for combating these differences is to first focus on the similarities and then make a strategic decision on boosting other SEO practices based on your target audience. Since Google is still the most used search engine, you’ll want to hit all of their unique points, but you can still incorporate some SEO practices that will boost your ranking in Bing. This can get tricky, so if you’d prefer to leave it up to the SEO professionals, we don’t blame you. That’s why we’re standing by to help. Contact us today at SEO Fuel and find out how our team of SEO experts can help you get ranked online, regardless of the search engine.